Q. Do you feel responsible for leaving Tavia all alone in an unheated house for two months and thus causing her horrible death? A. "No, I don't. To be honest with you, I feel it's the responsibility of a lot of individuals who didn't help us." There also is more than ample evidence to confirm that she was the victim of long-term neglect. For example, instead of giving her a daily grooming that all longhaired cats require, her owner had been sedating her and then shaving away the tangled fur from around her neck. Barbiturates never should be given to a cat except when surgery is required and the administration of these deadly drugs very well could have irrevocably damaged both her delicate liver and kidneys. Tavia also had lesions on her mouth which is one indication that she may have been suffering from an inflammatory skin disorder known as Eosinophilic Granuloma Complex (EGC). 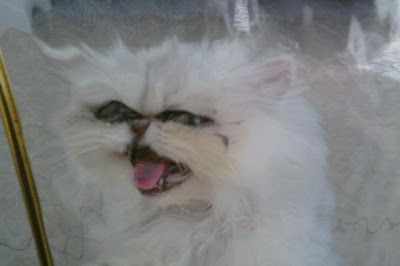 Of the three known varieties of EGC, she most likely had either a rodent ulcer or Eosinophilic Granuloma, both of which manifest themselves on the mouths of cats. The gallery of rogue individuals and groups responsible for Tavia's horrific suffering and untimely death constitutes a Who's Who of cat abusers, derelict humane organizations, and other assorted irresponsible and uncaring public officials as well as private citizens. If there were an ounce of justice in this miserable world all of them would be spending the holidays in jail as opposed to merrily continuing on with their destructive, shameful lives. At the center of this outrageous crime is a thirty-seven-year-old black evangelist from Milwaukee who passes herself off to the faithful as Prophetess Royal Poinciana Sprewell. A visit to her web site, www.royalpoincianaministry.com, exposes the shadowy world of black evangelicalism to be every bit as egomaniacal and preoccupied with the accumulation of wealth as their white counterparts. Sprewell even has the audacity to promote herself as the "number one prophetess called to the nations for this generation." To be objective about it, the Catholics historically have been the absolute worst when it comes to defaming and killing cats. That is in addition to sexually molesting children and gunning down abortionists. The more closely that its theological underpinnings, institutions, and the behavior of its adherents are scrutinized the more repulsive Christianity reveals itself to be. "I care not much for a man's religion whose dog and cat are not the better for it," Abraham Lincoln once observed and that always should be borne in mind when evaluating all religions, creeds, and public policies. In addition to whatever else she may be, Sprewell certainly is a busy individual. For example, she preaches at 1 p.m. Sundays on the Internet radio station www.rejoice1140.com. Additionally, she is pursuing both a degree in theology as well as an undergraduate degree with a double major in nursing and communications. Her ministry also claims to be involved in, inter alia, a monthly food pantry, food drives, missionary work, teen mentoring, clothing drives, prison outreach, and hospital visitations. Her future plans calls for teen pregnancy workshops, adult literacy classes, and humanitarian work in the Third World. To cap it all off, she is scheduled to address believers at a gathering called "Queens of the Kingdom Conference" to be held May 13th-15th at the Doubletree Hotel in Orlando. Tickets range from $75 to $200 with rack rates starting at $89. With all of that on her plate, it is not surprising that she went broke and could not afford either the rent or the electricity. The details are shrouded in secrecy but as best it can be determined she was being sued for non-payment and skipped out leaving Tavia to fend for herself. She, however, retained the keys to the house and claims that she stopped by once every three days in order to leave food and water for Tavia. 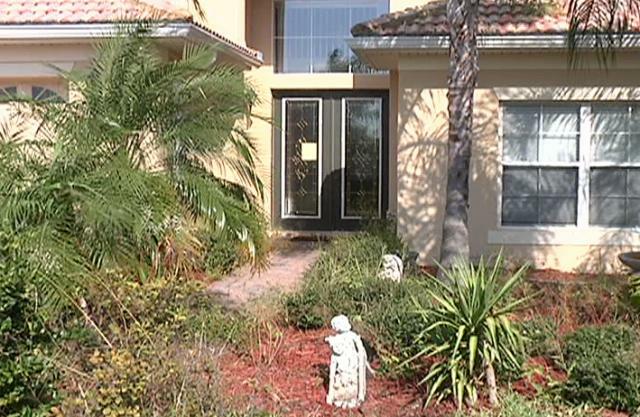 Once they entered the house officials from the OCAC did find unspecified amounts of both. Since OCAC posted a notice on the door some time before entering it has been suggested that Sprewell saw the notice and then dropped off some food and water after allowing Tavia to starve for weeks. As things now stand, the public only has her word that Tavia was being fed every three days during the last two months of her life. 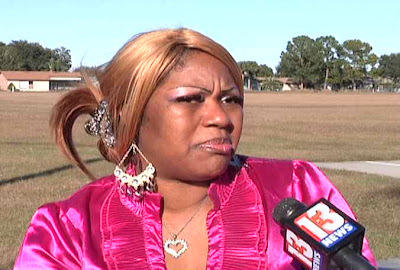 Most shocking of all, when asked by News-13 of Orlando on December 8th if she felt responsible for killing Tavia Sprewell was every bit as remorseless as she is irresponsible. "No, I don't," she shot back. (See "Owner of Cat Left to Die in Kissimmee Home Tells Her Side of the Story.") "To be honest with you, I feel it's the responsibility of a lot of individuals who didn't help us." Although totally reprehensible, such sentiments are by no means unique to Sprewell. In fact, they are heard every day all across America from the Oval Office and Wall Street on the one hand to Main Street and Skid Row on the other hand. Responsibility for oneself, one's family, the animals, Mother Earth, and the republic as a whole is a thing of the past in twenty-first century America. This society has devolved into a dog-eat-dog version of the old television game show Supermarket Sweep where the objective is transform this once bountiful country into a wasteland that is every bit as barren as Old Mother Hubbard's cupboard. Very few Americans have so much as an ounce of decency left in their bones. Despite her unwillingness to accept responsibility for killing Tavia, Sprewell nevertheless would have the world to believe that she cared deeply about her. "I loved Tavia," she declared in a video that accompanies the News-13 article cited supra. (See "Dead Cat's Owner Speaks.") "She was dear to our family." Almost in the same breath she turns around and claims that Tavia, in spite of the results of the necropsy, died of loneliness. "Because we gave her so much love and affection, and by us being away for basically a two-month period, she felt a lack of affection," she told News-13 in the article cited supra. It is not known how long Tavia was with Sprewell or from where she was acquired. Considering Sprewell's niggardliness, it is unlikely that she transported her from Milwaukee to Kissimmee and therefore she must have been procured locally and possibly even from OCAC. The only thing positive that can be said about her behavior is that if she had handed over Tavia to a shelter she would have been killed on the spot. Although her last days were painful, at least she lived an additional two months. Furthermore, if she had surrendered Tavia no one would have uttered so much as a syllable against her. Most citizens of this society have become so morally numb that the senseless slaughter of tens of millions of cats each year by shelters, Animal Control, PETA, wildlife biologists, and birders does not faze them at all. The next villain is Sprewell's neighbor, Santiago Sandoval, who by his own admission knew of Tavia's plight for at least a month before he informed OCAC. "The first time he (sic) didn't scream," he told News-13 on December 7th. (See "Cat Dies after Being Abandoned in Empty Kissimmee House.") "But the second time he (sic) said 'meow,' and the third time, he (sic) started to panic like he (sic) was asking for food or water." Even after he got up the gumption to contact OCAC Sandoval was ordered not to feed her. "There was nothing I can do," he added. "I asked him 'can we give him (sic) food, can we give him (sic) water?' He says 'no, we can't'." The him that Sandoval is referring to is presumably OCAC top dog Lee Radevaugh who through his dereliction of duty has not only proven beyond a shadow of doubt that he has no business dealing with animals under any circumstances but, more importantly, that he is a sorry excuse for a human being as well. For starters, as Tavia was wasting away he deliberately chose to hide behind what only can be described as bureaucratic self-serving silliness. "Our hands are tied in that there has to be probable cause to ask a judge for a warrant to go into a private dwelling or business," he told News-13 on December 7th. Quite obviously he does not consider saving the life of a dying cat to constitute probable cause. Since he publicly has endorsed Sprewell's sottise that a cat can die from loneliness, he likewise is defending his dereliction of duty on grounds of financial hardship. "We're in a very economic distressed time and our resources are limited," he bellyached. "We really limit our responses to truly emergency situations (such as) injured animals, bite cases and car accidents." He is such a despicable rotter that it is unlikely that he would give a dehydrated cat so much as a drop of water if he owned all of Niagara Falls! He and his inhumane attitude are symptomatic of all that is wrong with Animal Control and why their extermination factories must be outlawed and shuttered. At least in Sandoval's case his eyewitness testimony makes a liar out of Sprewell. If she was feeding Tavia every three days as she claims she certainly would have known that she was suffering terribly and near death. Also, the photograph that he took of Tavia will ensure that she is not easily forgotten. After their owner had hightailed it out of town in the middle of the night in order to return to Slovenia, a neighbor notified the police one week later. The services of a locksmith were secured and all six animals were rescued by Tierrettung Schober of Kärnten. "Drinnen bot sich uns ein Bild des Schreckens!" Nina Wimmer of Tierrettung Schober told Krone of Wien on December 13th. (See "Herzlose Frau ließ Hunde und Katzen in Wohnung zurück.") "Die Räume waren voller Kot, die Tiere mussten in ihrer Not den eigenen Urin trinken, un nicht zu verdursten." Thanks to the prompt action taken by the neighbor and Tierrettung Schober's intervention, the cats and dogs will, unlike Tavia, receive a second chance at life. "Wir päppeln die armen Viecherln jetzt wieder auf," Wimmer vowed. 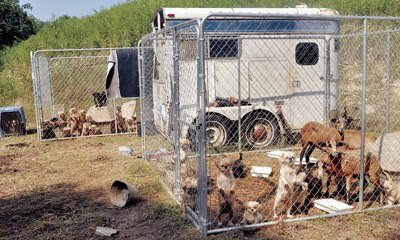 The cats and dogs, many of whom were suffering from eye and respiratory difficulties, were being held captive in a horse trailer as the thermometer outside soared to 100° F. Worst still, none of the animals had anywhere near an adequate supply of either water or food. Although under Kentucky law there is a three-day waiting period before abandoned animals can be seized under a court order, the Humane Society's Animal League for Life of Madison County was allowed to feed and water them. Later, the animals' owners, Robert and Lisa Richburg, surrendered them to the Madison County Animal Shelter. The tragic events in Villach and Baldwin demonstrate conclusively that caring humane groups, such as Tierrettung Schober, and decent human beings, such as Hendricks, do not stand idly by concocting lame excuses while animals are dying. Au contraire, they act promptly and decisively. The Kissimmee Police Department and the Osceola County Sheriff's Office also have blood on their hands for their failure to act. Unidentified deputies later had the temerity to tell News-13 in the December 7th article cited supra that they would arrest anyone caught breaking into a house in order to save the life of a cat. If a human's life were in danger there can be little doubt that the authorities would not hesitate to enter a locked dwelling and the same principle should be applied to cats and other animals in need. Much more to the point, the police never have been troubled by legal niceties and consider themselves to be above the law. For example, when looking for either fugitives or stolen property it is the modus operandi of most law enforcement officers to first break into buildings in order to substantiate their suspicions. They then later go to a judge in order to get a warrant so as to legalize their initial illegal search. Besides being habitual criminals and inveterate liars, the police use the law as a dodge in order to save them from investigating all sorts of crimes. Furthermore, their indolence can be partially explained by the fact that they often are either too busy committing crimes of their own or running personal errands, such as shopping, doing their laundry, and getting their hair cut, in order to be bothered with protecting both animals and the public. The owner of the house, who never has been publicly identified, also is guilty of gross negligence. Landlords who foreclose on homeowners and evict tenants are nevertheless responsible for whatever animals they leave behind. During the current economic downturn both homeowners and renters alike have forsaken tens of thousands of animals allegedly because they were unable to care for them. Such claims are disingenuous because if every American were given a million dollars most of them nevertheless would turn up the very next day at either the welfare office or their congressman's headquarters in order to plead penury. Humane organizations in Kissimmee, Orlando, and nearby areas also are to blame for allowing OCAC to get away with its crimes. 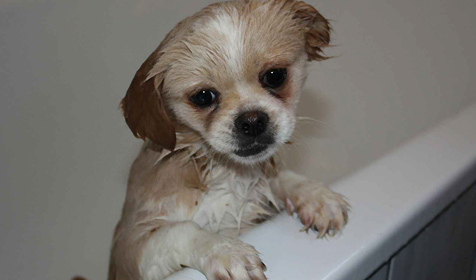 Some group, such as the SPCA of Central Florida in Orlando, should have intervened on Tavia's behalf. In particular, the types, extent, and likely causes of Tavia's fatal liver and kidney troubles should be made public. The inventory taken of her stomach also should be revealed. In particular, any telltale signs of malnutrition, dehydration, and drug abuse should be disclosed. Simply stating that Tavia died of kidney and liver problems is woefully inadequate and smells of a cover-up. An independent necropsy conducted by a qualified pathology department should be commissioned, that is if Tavia's remains have not already been burned. Considering Sprewell's callousness and cheapness it is doubtful that she provided her with so much as a Christian burial. Finally, OCAC has closed its investigation and elected not to charge Sprewell with animal cruelty. That inexcusable decision is contrary to the wishes of eighty-three per cent of those who responded to an online poll conducted by News-13. There will not be either any presents under the tree or yuletide treats for Tavia this holiday season. Struck down in the prime of life, she will not be around to usher in 2011 either. Although her tragic death is truly heartbreaking, the sadder news is that she is only one of countless cats who suffer similar fates each day. This country is chock-full of Sprewells, Radevaughs, Sandovals, and others who operate beyond the reach of all compassion, morality, and the law. Unfortunately, there is little that can be done about this deplorable situation due to the intransigence of the citizenry. Photos: Sandoval (Tavia), News-13 (house and Sprewell), Krone (abandoned dog), and Bill Robinson of The Richmond Register (abandoned animals in Baldwin). "Véritable ami et complice des enfants du Bristol, cette petite boule de poils leur apporte douceur et affection et contribue à renforcer harmonie et l'esprit familial du Bristol, une valeur incontestable de ce palace d'exception." "Pour ne jamais avoir une table de treize, je me souviens que le Savoy ajoutait un chat en porcelaine," he told Libération on November 17th. (See "Un chat persan de Birmanie s'installe au Bristol.") "J'ai donc eu l'idee d'en prendre un vrai." His selection of a Birman likewise was not a spur of the moment decision. "Mes parents ont toujours eu des chats de cette race, réputée sociable," he added. "Le chat se marie bien avec l'esprit du Bristol qui se veut un palace familial et non une grande chaîne internationale." 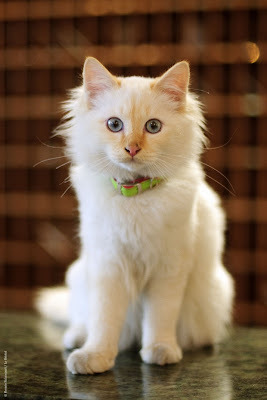 Although Birmans are known for their gentle and tolerant personalities, most children are anything but gentle and tolerant, especially when it comes to their treatment of cats and other animals. If the truth dare be told, a significant portion of them are known to horribly mistreat and abuse cats. Moreover, since Le Bristol is part of the Oetker Hotel Collection it has money to burn and therefore easily could afford to hire nursemaids for all of its rich brats. Instead, it is fobbing off that odious job on Fa-raon. "Les enfants l'adorent!" the hotel's mouthpiece, Mélanie Hubert, nevertheless chirruped to Libération in the article cited supra. "Il est tout le temps pris en photo et câliné car il est doux et très gentil." That very well may be the case for the time being but just wait until Fa-raon retaliates after one of those brats mistreats him and the hotel will have a lawsuit on its hands. The establishment is not saying but presumably it has taken the cruel and inhumane expedient of divesting him of his claws but he still has his teeth. Even if things should work out for Fa-raon in the short term sooner or later he is going to either get tired of being abused or simply get old and considerably less tolerant of being constantly pawed by strangers. Once that happened to its cats Anderson House got rid of them in short order and Fa-raon likely is destined for a similar fate. Caring for a cat is a sacred, lifetime commitment and businesses, such as Le Bristol, should be held to that unimpeachable standard just like individuals. Cats, after all, belong to places and should not be uprooted, especially once they have grown old. "Fa-raon, aux yeux bleus couleur océan, symbolise désormais la petite âme féline du Bristol," the hotel pledged in an earlier version of the press release cited supra. Despite that assurance it is, after all, a money-making operation and neither sentiment nor morality ever have counted for very much with the money men. It also is difficult to understand why Le Bristol's juvenile guests need to be provided with a cat in the first place in that the hotel permits them to bring along one from home for the payment of an additional €50. Most assuredly anyone willing to shell out €770 for one of the hotel's one-hundred-eighty-three rooms or between €1,100 and €2,300 for one of its seventy-eight suites is unlikely to squeal too loud about that nominal surcharge. The hotel's selection of a purebred also is disturbing. Although Birmans are not known to suffer any significant genetic maladies, purebreds nonetheless often are subjected to all sorts of horrific manipulation and abuse at the hands of breeders. As far as his diet is concerned there is both good and bad news. First of all, the hotel freely admits to feeding him croquettes which, due to their fat content and being fried in grease, could not possibly be good for his health. That is especially the case since some Birmans have a tendency to put on unnecessary weight. On the positive side, the hotel has stated that the rich fare served up by noted French chef Eric Fréchon is off limits to Fa-raon. Beyond that, the hotel is not saying what he is fed. Despite those criticisms, it is hoped that things will work our for Fa-raon at the hotel and that he will grace its corridors for a long time to come. Perhaps in doing so staff at the hotel over time will come to see him as an individual that is worthy of respect, protection, and even veneration as opposed to just another prop that enhances cash flow. 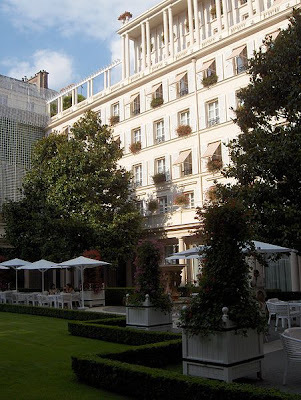 Photos: Le Bristol (Fa-raon) and Joe Shlabotnik of Wikpedia (exterior of the hotel). "He is so cute and rambunctious! He sleeps on his side with his head on the pillow and loves searching around." In a real-life Horatio Alger story that against all odds somehow came true, Jock V has gone from being a homeless cat at a shelter to lord of the manor at Chartwell House. For those unfamiliar with the name, that was Winston Churchill's old brick mansion in the tiny town of Westerham in the Sevenoaks District of Kent. Rescued by Cats Protection, whose main office is located in Haywards Heath, Sussex, Jock will live "in comfortable residence" as Churchill stipulated in his will. He will live in one of the top flats and have the run of both the mansion and its gardens. "He is so cute and rambunctious!" Alice Martin of Chartwell cooed to Kent Online on November 29th. 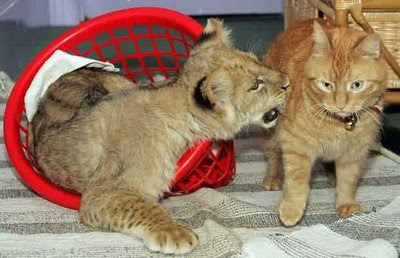 (See "Ginger Jock Gets Very Im-paw-tant Job.") "He sleeps on his side with his head on the pillow and loves searching around." In addition to being pampered by the staff and generally spoiled rotten, the young kitten has, oddly enough, developed a love for water. In fact, he is known to jump into the sink at every opportunity. When the sprawling redbrick mansion became too much of a financial hardship for him to operate and maintain, he sold it in 1946 to a group of wealthy businessmen headed by newspaper tycoon Lord Camrose (William Ewart Berry, 1879-1954) with the proviso that he and his wife, Clementine, be allowed to live there for the payment of nominal rent until they died. After his death, however, she advanced that timetable by giving the residence outright to the National Trust in 1966. Faithful to the former prime minister's wishes, the National Trust has maintained the residence and grounds, including the presence of a marmalade tom, pretty much as they were when he lived there. Visitors thus are ushered into one of the last remaining spots on earth where time seemingly has stood still and undisturbed for the past half century. 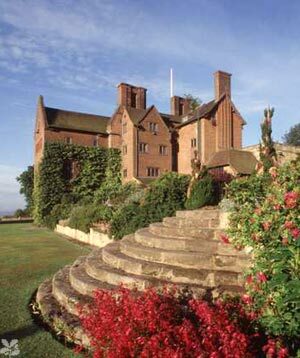 As an avid lover of all sorts of animals, Churchill sheltered and cared for numerous cats from the outset at Chartwell. The tradition of keeping a marmalade tom named Jock did not originate however until November of 1962 when a cat fitting that description was given to him by John Rupert "Jock" Colville (1915-1987) who served as one of his secretaries during World War II. "The Duchess is a real animal lover and thought Lucy was adorable," a source close to her told the Daily Mail on October 27th. 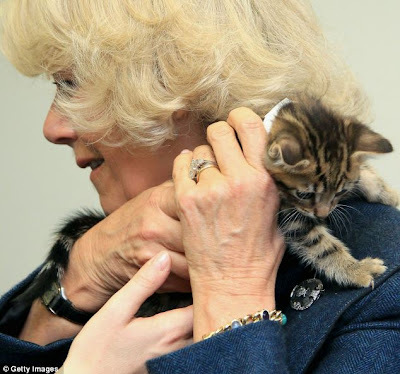 (See "Kitten Gets Her Claws into Camilla's Designer Jacket as Royal Opens New Battersea Cattery.") "She has worn the jacket dozens of times before and if there is anyone who doesn't give two hoots about having cat hair on her clothes it is her." That undoubtedly is a true statement because the Duchess recently adopted a homeless cat named Raybill. By way of contrast, no one in recent memory can recall any occupant of the Oval Office either so much as acknowledging that tens of millions of cats and dogs are unjustly slaughtered each year in the United States or taking the time to visit a shelter. Obama, for example, is so selfish, self-centered, and lazy that he only cares about playing golf and vacationing at resorts. It has not been possible to find out any information about Jock II but Jock III was described as a rather temperamental cat who sometimes would dig his claws into staffers and visitors alike. More than likely that was a bum rap and he instead simply got annoyed with strangers taking liberties with him. 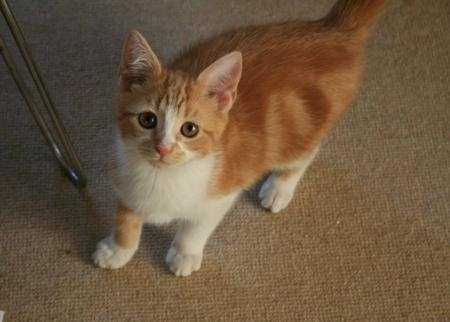 Jock IV, on the other hand, was known as a very accommodating cat who had the staff eating out of his paws. "He spends most of his day sleeping in various chairs and beds around his apartment," Bonnett related in the article cited supra. "He tends to be much more active at night, when he gets out and about in the garden." The petit fait that there is now a Jock V is a pretty strong indication that Jock IV, sadly, has joined his illustrious predecessors in Churchill's pet cemetery. Being top cat at Chartwell, like heading up the Vatican, is not the type of prestigious position that a cat can easily retire from even it he had half a mind to do so. Since Jock IV had a lucky staffer as a roommate, it is probable that Jock V also has been saddled with one. That should not impinge too much on his freedom, however, in that the mansion is outfitted with cat flaps. In spite of Churchill's obvious fondness for cats, there is some evidence to suggest that they nevertheless played second fiddle in the battle to win his affection. "I like pigs!" he once declared. "Dogs look up to us. Cats look down on us. Pigs treat us as equals." Looking ahead, the bad times spent caged at a shelter and, possibly, even roaming the mean streets are just an unpleasant memory for Jock. There will not be either any more nights spent roughing it or days scrounging around for his next meal. Additionally, he never again will know the sorrow of being forced to go without proper veterinary care. From now on he will dwell in the lap of luxury and, since his ship came in while he still was a kitten, that should be for a long time to come. It does not not happen too often anymore but deserving kittens, like nice guys, occasionally still come out on top. As an added bonus, the public is invited to meet Jock and to share in his good fortune as soon as Chartwell reopens to the public on March 13th. Entrée can be secured for as little as £10.60. Photos: Kent Online (Jock V), Ian Shaw of the National Trust's Photo Library (Chartwell), and the Daily Mail via Getty Images (Lucy and the Duchess). "Mäuschen wird im Zoo Berlin ewig Leben, sie kann gar nicht sterben." "Es ging ihr nicht gut," zoo veterinarian André Schüle told the Berliner Zeitung on November 18th. (See "Gnadenspritze für Kragenbärin Mäuschen.") "Sie litt seit Längerem unter Bewegungsstörungen. Wir mussten sie jetzt von ihren Schmerzen erlösen." That is, of course a debatable point. Since the zoo has not specified what types of movement disorders she was suffering from, she could have had either a form of Parkinson's disease, rhythmische Bewegungsstörung or stereotype Bewegungsstörung, the latter of which is common with caged animals. The important thing to bear in mind is that all of those ailments are treatable to a certain extent. In recent years, the eight-hundred-eighty-one-pound bear had suffered from chronic arthritis but she always bounced back and soon again was her old self. More importantly, the zoo has not produced any evidence that she was in pain and therefore required a Gnadenspritze. It also is suspicious that the zoo has not announced what was done with her remains. 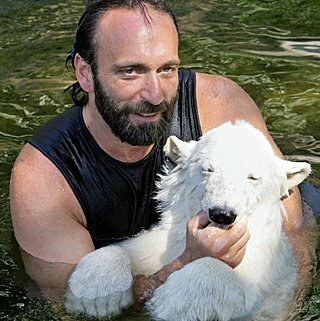 Back in the early 1990s, zum Beispiel, the zoo's infamous director, Bernard Blaskiewitz, sold three elderly Asiatic bears to a slaughterhouse. He also has been accused of peddling tigers and jaguars to China, which is notorious for exploiting them for their body parts and fluids, in addition to killing at least one-hundred-fifty animals for various reasons. Having arrived at the Hauptstadt's celebrated penitentiary for totally innocent animals as an infant in September of 1968, it is believed that Mäuschen lived longer in captivity than any previous Ursidae. If she had been given a choice between a lifetime of incarceration and five years of freedom there can be little doubt that she would have chosen the latter. The animals, like all halfway intelligent individuals, prefer quality of life over longevity. 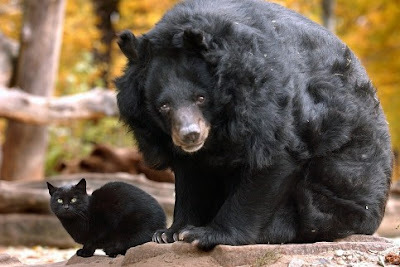 As for eleven-pound, jet-black Muschi, little is known of her life before she wandered in off the street in 2000 and shortly thereafter was taken under the protective wing of Mäuschen. Although it is not known exactly why Mäuschen took such an immediate liking to her, it is theorized that she viewed her as a substitute daughter. They soon were eating, sleeping, and sunbathing together and Mäuschen protected Muschi from her male counterparts who were intent upon doing her bodily harm from the outset. As an added bonus, the odd couple became immensely popular with both Berliners and tourists alike. Zoologists from various countries arrived in order to observe the interaction between the cross-species friends. It is not known, however, if they subjected them to any form of either experimentation or manipulation. It thus was Muschi's popularity with paying customers that more than anything else ensured that she would be permitted to go on living. Earlier in 1991, Blaskiewitz had rung with his own hands the necks of four other strays that had wandered into the compound. He may be a disgusting, sorry excuse for a human being but even his lust for feline blood is outweighed by his greed. For whatever it is worth, the Berliner Zoo claims that it no longer indiscriminately kills homeless cats. Instead they are supposedly trapped, sterilized, and relocated elsewhere by Wolfgang Apel and his associates at the Deutscher Tierschutzbund of Bonn. As for Muschi, she still is sleeping and eating in Mäuschen's old lodging but that is unlikely to be tolerated for much longer with space at the crowded zoo being at a premium. Moreover, zoo officials are worried that the loss of her friend could cause her to stop eating and, albeit unlikely, become aggressive. "So ein Verlust is für eine Katze nur schwer zu verkraften," Marcel Gäding of Tierschutzverein für Berlin told the Berliner Zeitung on November 20th. (See "Katze Muschi sucht einen neuen Bären.") "Immerhin gehören diese Vierbeiner zu den sensibelsten Tierarten." "Sie (Muschi) kann sich frei bewegen bei uns," the zoo's Heiner Klös told the Berliner Zeitung in the November 20th article cited supra. "Wenn ihr der Sinn danach steht, kann sie sich mit einem neuen Bären anfreunden." Although Muschi is vaguely acquainted with Knut through her association with Mäuschen, pairing them together is a terrible idea that places her life in danger. This is due principally to the fact that Knut, who will celebrate his fourth birthday tomorrow, is a male and therefore highly unlikely to view her as anything but dinner. The Berliner Zoo obviously is attempting to capitalize upon such as oddball arrangement as it did with Muschi and Mäuschen, but just because it worked with them does not necessarily mean that it will work with Muschi and Knut. The zoo has milked Muschi for all that she is worth and now it is time for it to do the humane and honorable thing and put her up for adoption. 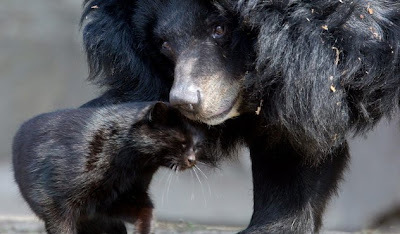 She belongs with a loving family and not in a den with either a polar or Asiatic bear. Placed with the right family, she probably would live longer and perhaps be even happier than she was with Mäuschen. Considering her international fame, finding a home for her would be a piece of cake. The usual hate-filled tirades that flow so freely from the maws of zoo officials, wildlife biologists, and bird advocates like raw sewage from a bloated septic tank consist almost exclusively of labeling cats as vermin that should be eradicated at all costs. Consequently, it is imperative that all of their dealings with the species are closely scrutinized. Since they require lactating cats for their schemes, the females that they maintain are not spayed and the toms are left intact which results in innumerable litters of kittens. No one is saying what happens to these kittens but it is suspected that they are similarly abused like their mothers and fathers if not killed outright. Such arrangement are most definitely exploitative and, most likely, criminal as well. They furthermore add to the overpopulation of cats that already exists. For example, at the Artis Royal Zoo in Amsterdam a cat named Gladys who had given birth to four kittens on June 27, 2008 was employed to nurse a red panda that had been rejected by its mother. Although the panda later died on July 17th, the zoo never has disclosed what became of Gladys's kittens. The naked exploitation and abuse of cats by zoos and wildlife groups must be immediately stopped. Not only do such institutions and individuals place the cats' lives in jeopardy but no group is monitoring either how they are treated or what happens to them once their gaolers have finished with them. More to the point, considering their avowed hatred of the species, these groups should not be allowed to come within one-hundred-feet of any cat. That is especially true of cat-killing wildlife biologists. The use and abuse of domestic cats is merely the tip of the proverbial iceberg as far as the crimes of zoos, wildlife centers, and captive breeding facilities are concerned. Most poignantly, for exotic animals such as Mäuschen to wind up in major cities like Berlin entails first of all that they had to have been forcibly removed from their families and habitats. An inquiry therefore should be undertaken to determine if such trafficking is in violation of the Convention on International Trade in Endangered Species of Wild Fauna and Flora (CITES). If not, the Convention should be strengthened so as to prohibit it. Secondly, all carnivores housed in these institutions must be fed meat which usually consists of live prey. At the Berliner Zoo, for example, sheep, goats, cows, and pigs are routinely fed to wolves. Domestic animals, already hideously abused in both the production of meat as well as the testing of weapons for the various military establishments around the world, certainly should not be fed to caged exotic animals. The same holds true for rabbits, mice, and other wildlife that are sacrificed in this brutal and inhumane manner. Wild animals belong in protected habitats and not in zoos, captive breeding facilities, or as the playthings of wildlife biologists. If only half of the resources devoted to these exploitative enterprises were redirected toward protecting animals in the wild the alarming rate of anticipated extinctions possibly could be halted. Now only Muschi and Knut remain from that once fabulous foursome. Even more worrisome, Muschi may not be alive much longer unless a vociferous public outcry forces the Berliner Zoo to better protect and treat her. Photos: Die Welt (Muschi and Mäuschen), Berliner Zeitung (Muschi and Mäuschen share a tender moment), Deutschen Presse-Agentur (Dorflein and Knut), Sky News (Arnie and Zara), and National Public Radio (Zoe with kittens and bobcats).